Photo Taken By Choo Jones at the Level Up Brunch w/ Karen Civil. You can keep the ladder and over recycled female sterotypes because Karen Civil has built a staircase fit for her unique capabilities, creativity, and classy pair of Christian Louboutin’s! The self proclaimed “Cultural Artige'” & “Digital Renaissance Woman” does more than her fair share of work to be considered a behind the scenes extra. She is at the forefront of the entertainment industry just by being a social media maven for entertainers galore. She couldn’t beat them, so she created her own lane. Karen Civil shows that there is no such thing as being the woman behind the man. This woman leads from the back but her personal fame speaks more for itself as her fan base has excessively grown over the past couple years due to her huge accomplishemnets with branding, marketing, and strategic decision making. She’s geniously stamped some of the biggest names and brands in the entertainment business and beyond including Dipset, Lil Wayne, Funkmaster Flex, Young Jeezy, Nipsey Hustle, YG, Pusha T, and products such as Beats By Dre and Carols Daughter. She highly promotes Nike products and can be seen wearing them whenever she plays with her Nike Football Society team in Los Angelos, the Turf Kings. Civil had embarked on a tour as of fall 2014, the Live Civil Tour, to inspire the masses and the young entrepreneur looking to gain the necessary skills to create their own path and career. I was lucky enough to attend the ATL wing of her tour at the Level Up Brunch, a series of informative and inspirational events for young adults in Georgia, in the start of 2015. She spoke of growing up in a Haitian family in a separated community in New Jersey where she felt rejected by several groups. In High School, she was more obssesed with the latest brand and what she was wearing, working just to buy the newest trends over planning for her future. My mom told me “You can be anyone you want in the world, including yourself.” She found herself feeling like a loner before finding a light in a internship contest for Angie Martinez with Hot 97. Although she made it far in the process, she did not get the internship which was highly upsetting. “I remember getting ready to jump up and say my thank you speech and accept my win until I didn’t hear my name being called. I cried so hard. I’ve never been so crushed,” said Civil. 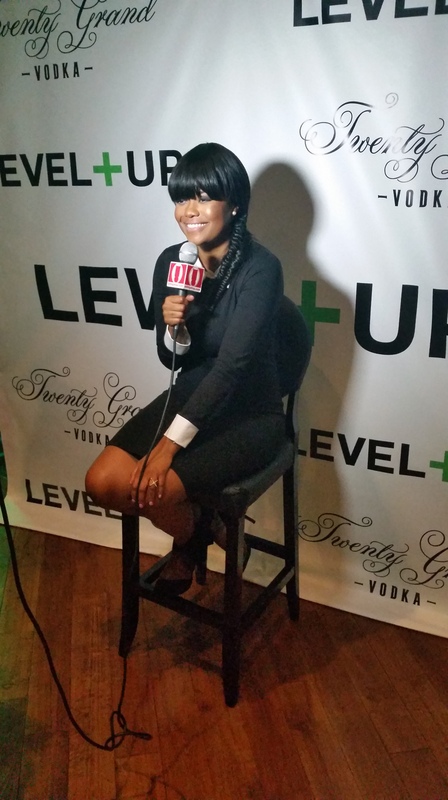 Karen Civil knows hardwork, dedication, and perseverance. She never let her faults or stumbles hold her back. And like a quaterback she seized the target and made a touch down every time. As she builds her own brand and becomes more well known through her extensive clientelle resume and social media, pictured at every event with every name in the industry from J.LO to Kanye West to even being invited to the White House for a meeting for My Brothers Keeper, this woman is a powerhouse and she has no intention of stopping now. A philanthropist as well, last year she broke ground and planted some good in her rooted upbringing from her parents native Haiti with the Live Civil Playground. She uses her social media to talk the talk, and run the walk. Decades to come women like Karen Civil will be remembered as more than beautiful mothers and wives, but as the greats in history before us that changed the game, broke the barriers, and gave way to innovation and limit less possibility. So get ready for some more Civil action! The WOUNDS 2 WISDOM TOUR OR W2W…Check it out this SPRING/SUMMER!!! Very inspiring article Phenom! There is so much Truth and Wisdom amidst these words! Thanks!